DAILY walking tour to FLAT TOP MESA section of new SAND TO SNOW NATIONAL MONUMENT, Jemez Homestead has private access road to RC Ranch Road into canyon. Jemez Homestead is in the Flamingo Heights section of Yucca Valley off Old Woman Springs Road as you drive toward La Copine Restaurant , The Integratron, and Landers. We are STUDIO NO 39 on the Highway 62 ART TOUR map. Jemez Homestead has private access road to RC Ranch Road into the canyon of Black Lava Butte/Flat Top Mesa section of new Sand to Snow National Monument. 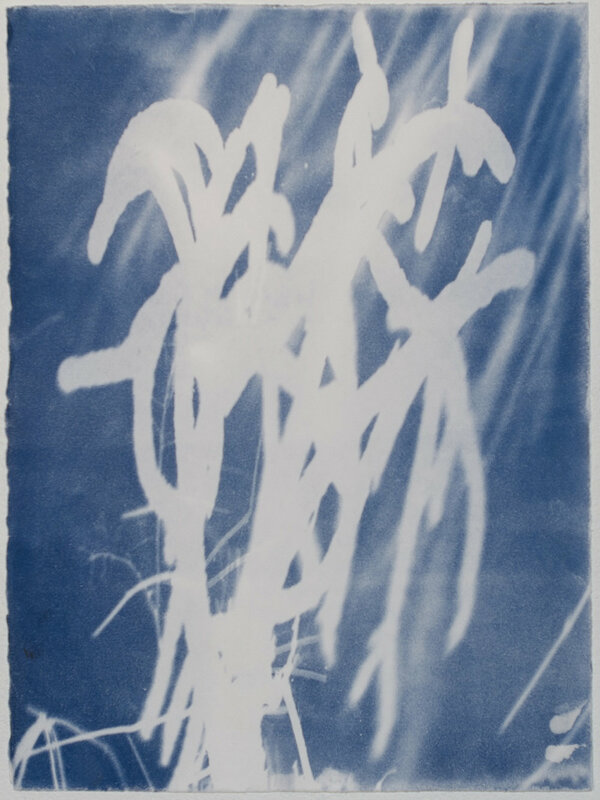 Kireilyn Barber is an artist in residence at Jemez Homestead who will be showing beautiful black and white photographs. 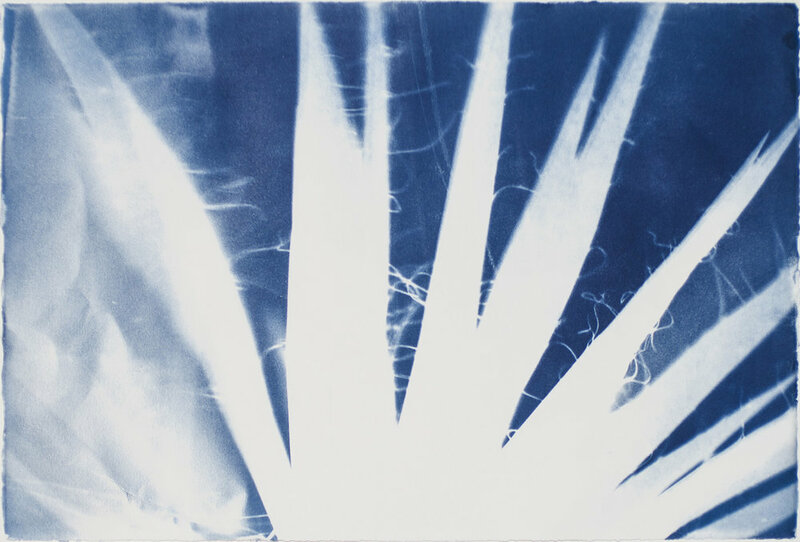 Madison is showing cyanotypes, brilliant blue photograms, of all the desert plants on the 5 acre JEMEZ HOMESTEAD property. 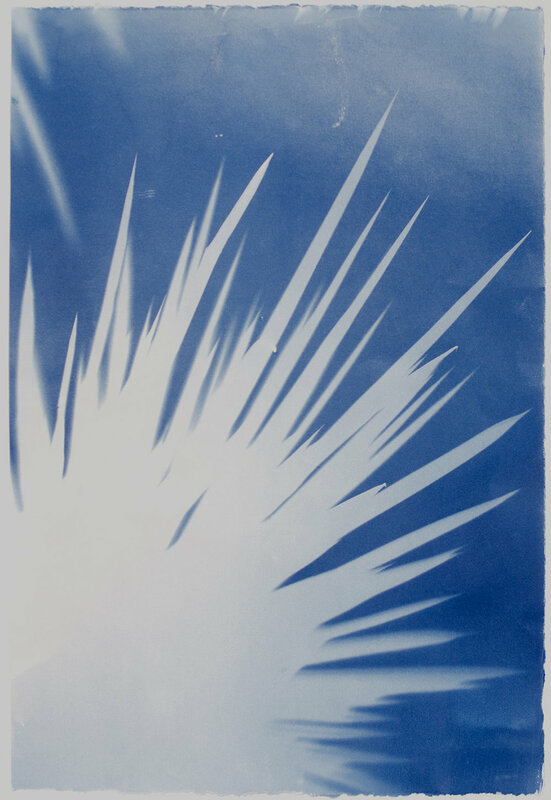 She also has made cyanotypes of other desert items, like guns, and fences, and rocks and sand. 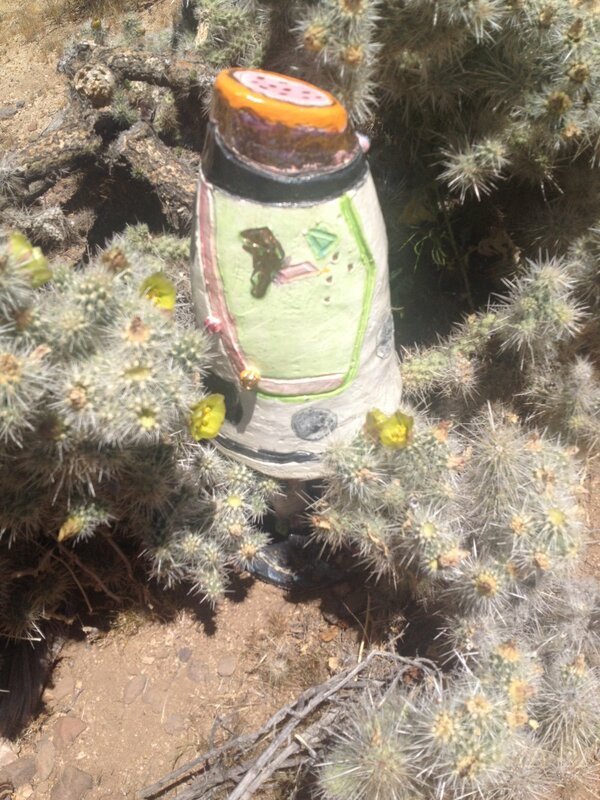 Lee Madison's ceramic sculptures surround the desert Bocce Ball court facing the ( extinct volcano) mesa that lies to the west of Flat Top Mesa. Check out pictures below. Come stroll through the art garden, play a game of Bocce Ball, have a cool drink. Black Lava Butte / Flat Top Mesa : Sand to Snow Natl Monument ( ACEC = Area of Critical Environmental Concern ) Black Lava Butte and Flat Top Mesa in the northeast foothills of the San Bernardino Mountains are home to both mountain and desert species. Varied soil types and topography allow plant communities ranging from cactus fields on the volcanic slopes to pinyon-juniper woodland to creosote plains. Over millennium, wind and weather have cut through the vast lava fields exposing granite bedrock below and leaving lava capped buttes high above. Many cultural sites cover the area including an extensive array of petroglyphs. Springs dot the canyon landscapes surrounding the buttes among granite boulder piles. • Location: North of Joshua Tree NP. Map: BLM Desert Access Guide Big Bear Lake. • The volcanic buttes that frame the skyline near Pioneertown are the last remnants of a vast lava field that covered the area 3 million years ago. Directions to Jemez Homestead / Studio no 39 : From Hwy 62, turn north on to Hwy 247/Old Woman Springs Road. Proceed for 8.5 miles and turn LEFT on Chaparral Road (dirt road) go to the top of the hill. Turn LEFT on Inca Trail, go to next top of hill. Turn RIGHT after the white picket fence, it will say private drive, road etc but it is the driveway. It is between the two properties, go till it dead ends at house. BEAUTIFUL View of new Sand to Snow National Monument. Directions: From Hero Market, go South on Hwy 247/Old Woman Springs Road, Go past the Lefevre’s Towing on corner of Luna Vista Road, past Wood Road, LEFT on Chaparral Road (dirt road) go to the top of the hill. Turn Left on Inca Trail. go to next top of hill. Turn Right after the white picket fence, it will say private drive, road etc but it is the driveway. It is between the two properties, go till it dead ends at house. BEAUTIFUL View of new Sand to Snow National Monument. Toy Soldiers found in Jemez Homestead yard with Mojave Yucca. 2016. 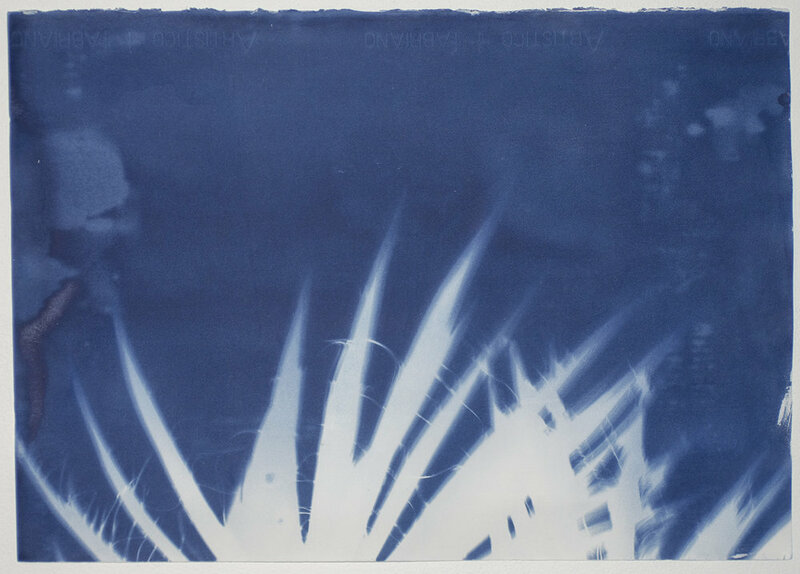 30" x 22"
Six Gun used in Pioneertown Wild West Show on Rives BFK paper. 2016 15" x 22"